House Speaker Nancy Pelosi denounces anti-Semitism during her address at annual AIPAC conference in Washington. House Speaker Nancy Pelosi denounced anti-Semitism as “anti-American” during her address at the annual American Israel Public Affairs Committee (AIPAC) conference in Washington DC Tuesday morning. "To be anti-Semitic is to be anti-American,” Pelosi said during her address. 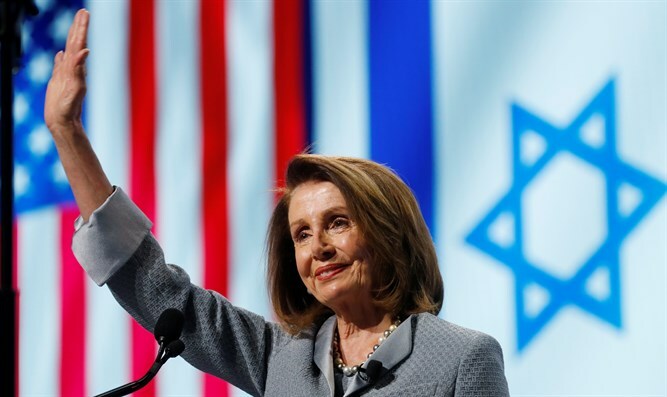 Pelosi also appeared to make a veiled attack on Republicans, suggesting some were attempting to use recent controversies involving Democratic lawmakers’ attacks on Israel to turn support for the Jewish state into a “wedge issue”. "From Israel’s founding through the present day, our pledge remains the same: Israel and America are connected, now and forever. We will never allow anyone to make Israel a wedge issue." At the same time, Pelosi pushed back on suggestions of dual loyalty or ‘allegiance to Israel’ levelled against supporters of the Jewish state. "In our democratic societies, we should welcome legitimate debate on how to best honor our values and advance our priorities – without questioning loyalty or patriotism." Earlier this year, Republicans and even some congressional Democrats accused Minnesota congresswoman Ilhan Omar of anti-Semitism, after she accused supporters of Israel of dual loyalty and “allegiance to” Israel. While House Democrats later drafted a resolution condemning anti-Semitism, Pelosi and other House leaders came under criticism after the resolution was later rewritten to condemn bigotry generally, rather than just anti-Semitism specifically. During her address Tuesday, Speaker also said Israel must maintain its “military edge”, and vowed US assistance to do so. "It is imperative that Israel maintains its qualitative military edge and America must ensure that it does."